"There's something about the rawness and imperfection of a polaroid Photo that makes it seem so infinite and in the moment. In this digital "Photoshop" world, revealing imperfections may be quite beautiful." I went out all day shopping, basically, with not much success. There was a Jonas Brothers shirt in the Sunday paper that i really wanted from Sears. I went to three Sears department stores and none of them had it :( It was only twelve dollars and really cute! I even went to i forgot what store, but they had another cute one, but it was a small D: On the bright side, I bought beyonce and britney spears' CDs for only three dollars each! I also unleashed my inner artistic nerd and went to an awards ceremony for a poster designing contest across Southern California and received fifth place! And did i mention the delicious 100% natural strawberry smoothie I had for lunch? Yesterday included a life-threatening 11.5 hour dance rehearsal. Danced from about 10am-9:30pm. KILLER. & i'm super sore today and i'm not sure i can make the most out of rehearsal today. But after rehearsal yesterday, was the annual dellos christmas potluck :D & i was grace's secret santa ! i gave her an h&m giftcard. Lovely gracious gave me a beautiful REVERSIBLE jacket. That's right folks, be jealous. And stupid tawnyo's secret santa was grace, but you can't tell because STUPID tawnyo didn't bother to wear her scarf in the picture ! 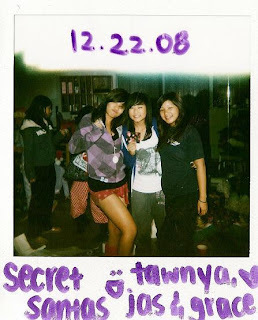 Haha, i love you tawnya :) My Taylor Swift, Santogold, and Kanye West CDs came in the mail, too! It seems like half of Taylor's album is about Joe Jonas. But I actually really like her music. Jonas Brothers posted a new youtube video :) & guess what? I could've been there. It was a free concert, where they played acoustics, covers, and had special guests like demi lovato, jordan sparks, and jesse mccarteny. And Frankie sang! IT was FREE and i knew about it myself! But it was a late school night so my dad didn't let me go :( I'm still so upset about it, cause they played john mayer songs & unreleased songs, and so much more. Man, I wish I could've went. Been out all day until now. Two Target stores, optometrist, Krispy Kreme, Boba Tea Hut, Scholastic Book Fairs, Walnut Library. Hiphop rehearsal later at 7. I wore my Jonas Brothers tour shirt, and my eye doctor said, "The Jonas Brothers?! I have no idea who they are, but I know they are EVERYWHERE." I bought a lot of books (: Speaking of which, the Burning Up book should really be an AR book, cause I could ace it without reading it! -two extra weeks of winter break, please ! i'm sure there's much more thats not coming up in my mind right now.